Despite the headway the world has experienced over the years in terms of a substantial increase in digital access, there are still significant challenges to overcome in ensuring women are included in the transformation to a digital society and leapfrogging productivity and social development. Efforts to increase internet adoption access through broadband plans and legislative reforms have yielded improvements in use and adoption. However, a stark gender inequality is pervasive in terms of access, ownership of digital devices, digital fluency as well as the capacity to make meaningful use of the access to technology. Even though affordability is a key source of exclusion, there are also significant socio-cultural norms that restrict access for women. This policy brief brings forward the argument that access alone is not enough, women need agency and capacity to leverage access. We thus highlight the need to make an assessment of the global gender gap and develop meaningful indicators that contribute to the design and implementation of effective policies that drive adoption. We need effective promotion of women´s digital adoption not only from the government but from the private sector and civil society to lead the digital adoption for women of best practices around the world. Despite the headway the world has experienced over the years in terms of a substantial increase in access as well as the availability of new applications and more affordable handsets, there are still significant challenges to overcome in ensuring women are included in the transformation to a digital enabled society. Ensuring women can efficiently adopt new digital technologies would benefit worldwide productivity and social development. Access to mobile services in low and middle-income countries is indeed increasing, alongside falling prices and a vibrant internet ecosystem, as a result of information and communication technologies (ICT) policy reforms implemented since the early 1990s (Byrne & Corrado, 2015; Mariscal, J, Galperin, H & Viecens, F, 2016). However, a closer examination reveals significant gaps not only in terms of digital access but also in the ability of specific social groups to leverage new technological applications for socio-economic development. Many groups, such as older adults, indigenous groups, and in particular, women, continue to fall behind in opportunities to effectively use ICTs to improve their livelihoods. As numerous areas of daily life and basic services are delivered by digital technologies, only some people will be able to harness the opportunities of engaging in the economy, of communicating and establishing social networks as well as having access to improved public and private services. The welfare gap between those with access to ICTs and the digitally excluded, salient among them, women, will widen and thus increase worldwide inequality. Existing gender gaps in digital inclusion, if not properly addressed, are likely to lead to gender inequalities in many other areas, including inequalities in labour markets and less financial inclusion of women. This is because digital technologies are omnipresent and digitization affects all areas of our lives. Not only are digitally excluded women likely to be excluded from attractive and lucrative employment opportunities, because they lack digital literacy, which is one of the most demanded skills in the digital age. Their digital exclusion will also prevent them from finding a fairly paid job. The job search markets are becoming increasingly digital and many employers prefer to hire their employees on online job search platforms. Women without access to such platforms run the risk of receiving significantly lower wages for their work than current market wages. Therefore, the inability to access and use digital technologies is likely to lead to an even wider gender pay gap. A better digital inclusion of women will also significantly improve their financial inclusion. Women often lack collaterals required by traditional financial institutions to prove their creditworthiness. Digital economies are data-driven economies in which data capital is an important asset. New financial technologies use computer algorithms to analyze customer data in form of digital transaction records and to decide whether a particular customer should receive a loan or not. Digitally excluded women lack this important asset, which makes them riskier and less trustworthy for providers of financial capital. Time is a crucial factor here, because the longer it takes to close the digital gender gap, the less data capital women will be able to accumulate, which could lead to a much wider gap in financial inclusion. Thus, policies aimed at reducing gender gaps in digital inclusion will further empower women by preventing and reducing gender inequalities on labour markets and improving women’s financial inclusion. If existing digital divides are addressed, particularly low and middle-income nations, where the digital gender gaps are the largest, could experience a leapfrogging process towards development. It would enable developing nations to leverage new technologies for long-standing challenges, including effective healthcare, education, political participation, and civil rights, among others. ICTs have the potential of transforming industries, providing opportunities to deliver services in new and efficient ways that can reach the most disadvantaged. Like mobile phone ownership did for voice, mobile broadband is driving internet take up. Across Africa, Asia and Latin America, people are accessing the internet for the first time through their mobile devices. However, as of 2015, it was estimated that 200 million fewer women—some 14% globally—than men owned mobile phones. (GSMA, 2015). The adoption of mobile technologies alone can play a substantial role in shortening the gender divide by making women “feel safer and more connected, and provide access to information, services and life-enhancing opportunities like health information, financial services and employment opportunities” (GSMA Mobile Gender Gap Report, 2018). Efforts to increase internet adoption access through broadband plans and legislative reforms have yielded improvements in digital adoption around the world. However, a closer look at these advances shows a stark gender inequality in terms of access, ownership of digital devices as well as digital fluency. According to Equals Global Partnerships, in the world, 200 million fewer women than men own a mobile phone, 250 million fewer women than men use the Internet and only 6 percent of women develop apps. Even though mobile phone ownership and access in low and middle-income countries, has grown exponentially, recent studies show that women continue to be left behind; the prevalent gender inequality permeates the digital arena. India is the world’s second biggest market for mobile phones, with more than one billion users, yet women make up only 2% of internet users in rural areas. (Aljazeera. India: Banning Women from Owning Mobile Phones. 2016). Across low- and middle-income countries 390 million women are unconnected and 184 million fewer women than men own a mobile. As Graphs 1 shows, there is a significant gender gap in mobile ownership and mobile internet use across low and middle-income countries, where South Asia stands out in the higher degree of gender inequality. Moreover, as Graph 2 indicates, the gender gap in mobile internet use is persistent and growing. Thus, even when women own mobile phones, there is a significant gender gap in usage for more transformational services, such as mobile internet (GSMA, 2018). Source: The Mobile Gender Report 2019, GSMA. Note: 2016 are estimates. The gender gap is the difference between the Internet user penetration rate for males and females in relation to the internet user penetration rate for males, expressed as a percentage. Source: ITU. This data is corroborated by the AfterAccess Global South Survey that reveal that, in Africa, Latin America and Asia, women have less access to technology than men, even to mobile services that are widely used by the poor. Women in low- and middle-income countries are, on average, 10% less likely to own a mobile phone than men; 184 million fewer women own a mobile phone. This survey also show that urban users far exceed rural users in all three regions. Even if there is mobile broadband coverage, people are not necessarily getting online. Over 1.2 billion women in these regions do not use mobile internet. Women are, on average, 26% less likely to use mobile internet than men. Even among mobile owners, women are 18% less likely than men to use mobile internet. In Africa, the percentage of mobile phone penetration is higher for men than for women in Kenya, Ghana, Nigeria, Tanzania, Rwanda (the most unequal country with 50% for male population and 32% for women), and Mozambique. Smartphone penetration, as well, has a larger percentage for the male population than for the female population: South Africa, the country with the highest penetration, has 60% access for men and 52% for women. In Asia, the gender gap in mobile ownership is almost 50%. In India: from the 61% of people owning a mobile phone, 79% are men and 43% are women. In terms of internet use, in Bangladesh, 18% of the people having internet use are male and 7% are women: almost a 62% gap for only the 13% of people with Internet access. The gap in Cambodia is 34%. In Latin America, the only countries where a gender gap in mobile phone penetration does not exist is Colombia. The region shows a lower gender gap than in other regions of the global south. In Argentina this gap is very small, while Perú shows a more significant difference. 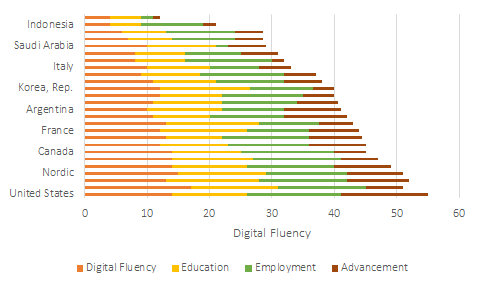 As seen in Graph 3, developed countries such as the U.S., the Netherlands, the UK, as well as the Nordic countries (Sweden, Denmark, Norway, and Finland) have the highest digital fluency scores and rank among the top performers in workplace gender equality. However, in the majority of the countries, low levels of access are likely to further constrain the capacity of women to access new digital economy opportunities. In a rapidly transforming workplace, digital fluency is going to become a paramount skill. The digital gender divide becomes even more pronounced when it comes to women as creators of technology. This is also an issue in developed countries, where access to and affordability of digital technologies is almost equal for both sexes. In the USA, women account for 57% of all professional occupations, but only 25% of all computing occupations. There is only a negligible share of women from minorities in such occupations. While 88% of all ICT patents are invented by male teams of inventors, only 2% of patents are invented by female teams of inventors (Ashcraft et al. 2016). When it comes to commercialization of knowledge, only a few women, compared to men, decide to set up a new business venture in the ICT sector. This pattern applies to almost all G20 countries and is largely independent of the country’s level of economic development (Sorgner et al. 2017). According to the AfterAccess Survey, unaffordability is consistently the main barrier to digital inclusion across all developing regions. The cost of devices and services were cited along with relevant content as inhibiting factors for digital adoption. Other significant barriers include lack of connectivity and lack of access to a device. A salient barrier is both low literacy and lack of digital skills. Women are less aware of mobile internet compared with men, which significantly limits their uptake, particularly in Africa and Asia. Another barrier across markets, often felt more strongly by women, is a perception that mobile internet is not relevant to their lives. The absence of electricity was identified in this survey as a big challenge to overcome in parts of Asia and Africa. Socio-cultural factors are a key impediment to access for many women. The gender gap in mobile ownership in India – estimated at about 114 million – reinforces the fact of unequal access but also paints an incomplete and misleading picture. A survey conducted in semi-rural Madhya Pradesh revealed that a majority of the women who owned a mobile phone did not know how to operate it. Unable to read or write, they could not dial a number or read messages; most did not know their mobile numbers and had to ask their husbands. Their mobile phone usage was mostly limited to pressing the green button when the phone rang. The digital divide is thus not simply a question of access to digital technologies but about the capacity to make meaningful use of its access. In Madhya Pradesh, as in many parts of rural and semi-rural India, this capacity is directly shaped by gender biased belief and value systems that impose restrictions on the education and free mobility of women. Census 2011 data indicates that 65.46% of women are literate as compared to over 80% of men. Further, 23% of girls drop out of school before they reach puberty. A recent study, aptly titled ‘Whatever she may study, she can’t escape from washing dishes: Gender inequity in secondary education’, also finds that the engagement of girls in housework and domestic chores is the largest contributor to a gender gap in secondary education. Patriarchal attitudes and beliefs also restrict women’s rights to public spaces, preventing them from accessing community internet centers, outside employment, and co-ed training facilities. Thus, poverty and socio-cultural norms that affect women’s educational opportunities in general are primarily responsible for digital gender divide. Socio-cultural norms can fuel gender stereotypes concerning the use of technologies, and these stereotypes are often reinforced in girls’ closest environment, their families. Parents can directly or indirectly discourage girls to use technology during early socialization. In this way, they may shape girls’ preferences regarding their future career choices in science and technology. Without sufficient female role models outside the family, it becomes even more difficult to overcome gender stereotypes. Many barriers to women’s digital inclusion are traditional gender restrictions, which manifest themselves in laws or socio-cultural norms, poverty, lower educational opportunities for girls and restricted access to labour markets, as well as persistent gender stereotypes. Accordingly, policies aimed at empowering women by eliminating these traditional restrictions will also promote their digital inclusion. Moreover, there are more and more examples of how governments and NGO’s can address women directly to improve their digital inclusion (see Sorgner et al. 2017 for an overview of existing programmes in the G20 countries). The following cases document the importance of agency to address current digital gender exclusion. By promoting the successful adoption of digital technologies by women, they are able to harness the opportunities offered by ICT; allow their inclusion to markets, public services, political participation and social networks thus diminishing existing vulnerabilities. Prospera Digital is one of Mexico’s most recent case studies that had digital inclusion as one of its main objectives. The initiative was aimed at promoting maternal and infant health among some of Mexico’s poorest. Prospera is one of the world’s oldest and largest conditional cash transfer programs. Its model has been replicated in several countries due to its effectiveness in ensuring that beneficiaries are co-responsible in their and their families’ social development. The digital component of the program was aimed at Prospera beneficiaries who were pregnant or had an infant. They were provided with a mobile solution that could empower them with knowledge about the different stages of their pregnancy, offer them health advice on areas such as nutrition and physical activity and ensure that they could identify risk factors that could potentially lead to birth complications or death. This mobile solution was a two way automated messaging system that could be used on basic, feature and smartphones. The messages were designed by the Health Ministry with the aid of international organizations that specialise on behavioural science. This was done to ensure that women not only received reliable, valuable and potentially life saving information in an accessible way, but that the messages could coax them into adopting healthier behaviors. The results of this pilot program proved effective in impacting the baby’s health indicators such as height and weight at birth as well as other indicators such as length of the pregnancy and number of prenatal consultations, both of which are key elements to prevent birth complications. The pilot program also proved effective in helping women adopt mobile technology in new and useful ways, indicating that pertinence is a key element to promote adoption. Prospera Digital had an important training component, through which users were introduced to the program and also completed a brief workshop with the objective of teaching women how to engage with the SMS platform. In many cases, women were familiar with the use of SMS messaging, but many others had to learn. Most women in the program used their own phones, however some of the them had to learn to use cellphones for the first time. These basic phones were distributed for the purpose of the pilot. EQUALS Global Partnership is a global network with more than 50 partners from government, NGOs and civil society. It was initiated in 2016 through an alliance between the International Telecommunications Union (ITU), UN Women, the International Trade Centre (ITC), GSMA and the United Nations University. Aware of the problem that women are excluded from opportunities in the financial, educational, social and health resources of the digital world, their objective was to collaborate among actors capable to transcend borders and cultures. EQUALS Global Partnership includes an action plan of data gathering, knowledge sharing and advocacy strengthening. The network focuses on improving women and girls’ digital technology access, connectivity and security, supporting development of science, technology, engineering and math skills of women and girls and promoting women in decision-making roles within the ICT field. These access, skills and leadership priorities have resulted in the creation of the Global Digital Gender Equality Action Map, a database of initiatives that seek to bridge the digital gender gap around the world. EQUALS has enabled a repository of relevant research and grants yearly awards to outstanding projects. The winner in the skills category was the Digital Citizen Fund of Afghanistan, for building 13 information technology and media centres that provided internet access to 55,000 people and training to more than 10,000 women in digital literacy, financial literacy and entrepreneurship. More than 100 women have launched their own startups. The Access award was granted to Lebanese Alternative Learning, which developed “Tabshoura in a Box”, a platform that functions independently of the internet access and electricity. It constructed a hotspot where students access digital learning resources even in rural areas. Currently, three school and three learning centers are using Tabshoura in a Box. Sula Batsu Cooperativa of Costa Rica won the leadership award for creating rural “technological poles” lead by women to empower them to launch their own digital businesses. EQUALS claims the programme has impacted 1,500 rural young women. It also hosts a network of 400 girls who meet regularly to define and implement actions around women in tech, the results of which influence university curricula, companies and public policies. The Athena SWAN Charter was promoted by the British Equality Challenge Unit in 2005 to to promote the inclusion of women in science, technology, engineering, maths and medicine (STEMM). The charter now recognizes also work in the fields of arts, humanities, social sciences, business and law. Athena SWAN Charter´s priorities are to help women advance in academia, to retain their participation in the carrier pipeline, to address the gender pay gap, transitioning women from PHD to sustainable employment and avoiding discrimination. There are currently 143 members in the Charter with a total of 699 awards that recognise good practice in achieving gender equality. Athena has created a repository with information from all the winning projects. In the United Kingdom, there are 93 institutions that hold Athena SWAN Award. This accreditation program functions as a way to positively sanction organizations that create an inclusive workplace. Requisites for receiving an Athena SWAN award are: collecting data on their current gender equity standards, policies and practices, identifying weaknesses and shortcomings, developing and implementing plans to improve gender equity at all levels of seniority, for casual, full-time and part-time staff, as well as for students and demonstrating improvements in gender equity over the course of two years. Athena SWAN was evaluated in 2014 and holders of an award experienced changes in the working environment and organizational culture such as: women were more familiar with promotion processes, more likely to receive rewards for their work, improved their visibility, increased their self-confidence, enhance their leadership skills, saw benefits in terms of career development and in managing work-life balance. Athena SWAN is operating also in Ireland and Australia. The organization Science in Australia Gender Equity (SAGE), a program of activities designed to improve gender equity and diversity in the Science, Technology, Engineering, Mathematics and Medicine (STEMM), has implemented a pilot that involves 45 Australian Charter members, including 30 universities, 6 medical research institutes and 4 government science organizations. The Internet Saathi initiative, supported by Google and Tata Trust’s partnership, aims to facilitate rural women’s engagement with the internet by training them in rudimentary internet skills and providing them with an internet enabled device. Once trained as ‘saathi’s’, more than 30,000 women across 1.1 lakh villages have helped other women access and utilise the internet in various ways.4 Anecdotal evidence indicates that women enrolled in the programme have utilised the internet in imaginative ways, from increasing awareness around health issues, to improving their earnings and productivity. Governments around the world need to implement legal and regulatory frameworks that drive ICT adoption. These frameworks must consider that internet as a general purpose technology and is transversal to all sectors of the economy as well as to the political and social spheres of nations. Policies need to create and strengthen public agencies that coordinate the transversal integration of digital strategies across ministries. Through transversal and integrated policies, government should act as a catalyst for change; promote the active participation of key actors in the promotion and adoption of gender ICT adoption. Inclusive policies must effectively promote useful and meaningful content for women via digital platforms to increase access and use of basic services. Progressive policies would promote technological innovation as driver for social inclusion and economic participation of women. Design and implement capacity building programmes for women that include teaching digital skills and individual mentoring that accompanies women through the learning and adoption process in a case by case basis. Restrictions on mobility, for example, often result in women losing access to community internet centres and training facilities. Informal education and life-long learning spaces are important to impart digital fluency skills to women. More broadly, this highlights that skilling initiatives to equip women and other social groups with capabilities for future jobs cannot work in isolation; skilling will have to be undertaken alongside broader social policy interventions. Promote education of women in science and technology fields through scholarships, internships and training programs and consider gender quotas for admission into education programs in order to strengthen women participation in decision making positions and leadership within the STEM sector. Design digital procurement strategies that promote increased private supply of ICT services. Interventions to address digital exclusion of women must take into consideration prevailing socio-cultural norms, eg. women might need informal learning spaces. Low levels of education and skilling inhibit women’s capacity to digital technologies. These ‘old’ problems needs to be urgently addressed to meet the ‘new’ digital challenges. New tools will be needed such as family counselling and innovative new pedagogies. Statistical data on digital inclusion are scarce and usually not disaggregated by gender. Disaggregated statistics should be made available. In addition, measures of digital inclusion should be improved to make them comparable across countries. This is particularly important for evaluating the effectiveness of policy measures aimed at improving digital inclusion in general and reducing gender digital divide in particular. More research needs to be done to better understand the dynamics and the underlying causes of the gender digital divides in different countries. AfterAccess, 2018. Diálogo Regional Sobre Sociedad De La Información, LIRNEasia, Research ICT Africa, www.afteraccess.net. “Bridging the Digital Gender Gap.” Betterplace Lab, www.betterplace-lab.org/en/bridging-the-digital-gender-gap-2/. Bridging the Gender Gap: Mobile Access and Usage in Low and Middle Income Countries. GSMA,2015,www.gsma.com/mobilefordevelopment/wp-content/uploads/2016/02/Connected-Women-Gender-Gap.pdf.GSMA. Byrne, David, and Carol Corrado (2017). ICT Asset Prices: Marshaling Evidence into New Measures, Finance and Economics Discussion Series 2017-016. Washington: Board of Governors of the Federal Reserve System, https://doi.org/10.17016/FEDS.2017.016. “ECU's Athena SWAN Charter.” Equality Challenge Unit, www.ecu.ac.uk/equality-charters /athena-swan/about-athena-swan/. Getting To Equal: How Digital Is Helping Close the Gender Gap at Work. Accenture, Getting To Equal: How Digital Is Helping Close the Gender Gap at Work, www.accenture.com/t 00010101T000000__w__/ar-es/_acnmedia/PDF-9/Accenture-Getting-To-Equal.pdf. “India: Banning Women from Owning Mobile Phones.” Al Jazeera, 26 Feb. 2016, www.aljazeera.com/news/2016/02/india-banning-women-owning-mobile- phones-160226120014162.html. 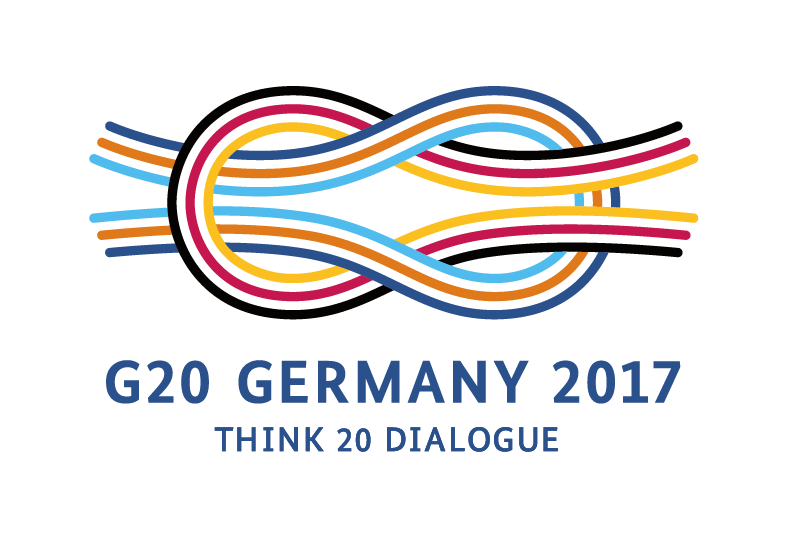 Women20 For the G20: 2017 Inaugural Asia-Pacific Dialogue. Honolulu: East-West Center, February 2018, www.eastwestcenter.org/system/tdf/private/W20_web_1.pdf?file= 1&type=node&id=36472. Markozashvili, Darejani. “Media (R)Evolutions: Trends in Information and Communication Technologies.” World Bank, 11 Jan. 2017, blogs.worldbank.org/publicsphere/miga/ taxonomy/term/14957. Sorgner, A., E. Bode and C. Krieger-Boden (2017), The Effects of Digitalization on Gender Equality in the G20 economies, E-book, Kiel Institute for the World Economy, https://www.ifw-kiel.de/pub/e-books/digital_women-final_report.pdf.